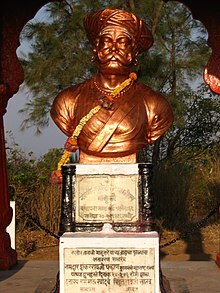 Tanaji Malusare was a Maharashtrian Koli military leader in the Maratha Empire. He fought alongside Maratha leader Shivaji Maharaj in various battles throughout the years. He is most famously known for his role in the Battle of Sinhagad in 1670 A.D. In 1670, Tanaji, who hailed from "Umrathe" near Mahad, Konkan, was busy making preparations for his son, Rayaba's wedding when he was summoned by Shivaji for a meeting.Tanaji put the wedding plans on hold and immediately left for the meeting. On hearing Shivaji's plan to recapture Kondhana fort near Pune from the Mughals, Tanaji took charge of the campaign and started his preparations. Upon reaching the foot of the fort, Tanaji and his detachment of 300 troops were said to have scaled the fort from the western side on a dark night with the help of a domesticated Bengal monitor lizard (called ghorpad in Marathi) named Yashwanti to which they were said to have tied ropes and sent crawling up top to the precipice of the fort. After two failed attempts, Tanaji and his men successfully scaled the steep hill fortress. Once inside and after opening the Kalyan Darwaza, Tanaji, his men and another detachment of 500 troops headed by Suryaji (his younger brother) attacked the army holding down the fort. The fort was controlled by Udaybhan Rathod, a rajput officer appointed by Mughal general Jai Singh I. A fierce combat took place between the forces of Tanaji and Udaybhan. During the battle, Tanaji broke his shield but he continued fighting by tying his upper garment over his defending hand in order to ward off Udaybhan's blows. The fort was eventually conquered but in the process, Tanaji was gravely wounded and died fighting on the battlefield. As a tribute to the bravery of Tanaji, the fort was renamed, Sinhagad (lion's fort) by Shivaji. A medieval era Shahir (a poet who reads aloud his own poems) named Tulsidas,[a] wrote a Powada describing the bravery with which Tanaji fought and conquered the fort of Sinhagad. Freedom fighter and Hindu Mahasabha leader, Vinayak Damodar Savarkar wrote a Ballad on Tanaji Malusare but it was banned by the colonial British government. This ban was lifted on May 24, 1946. Gad ala pan sinh gela, a 1903 Marathi novel named based on his life. Sinhagad, a Marathi film based on the 1903 novel. Bollywood Superstar Ajay Devgn announced a film based on the life of Tanaji Malusare named Taanaji - The Unsung Warrior scheduled to come out in 2019. 1.^ This monitor lizard story is disputed among historians. "Gorpade" is a common surname amongst Marathas and it is likely that one of the first people to scale the fort was named "Gorpade"
^ David Hardiman (1996). Feeding the Baniya: Peasants and Usurers in Western India. Oxford University Press. p. 221. ^ Madhav Gadgil (2005). Ecological Journeys. Orient Blackswan. p. 1. ISBN 978-81-7824-112-8. ^ The Dawn and Dawn Society's Magazine. 1907. pp. 1–. ^ Gordon, Stewart (1993). The Marathas 1600-1818 (1. publ. ed.). New York: Cambridge University. p. 70. ISBN 9780521268837. ^ K. Ayyappa Paniker (ed.). Medieval Indian Literature: Surveys and selections, An Anthology, Volume One. p. 375. ^ Derek Jones, ed. (December 1, 2001). Censorship: A World Encyclopedia. Routledge. ^ Sisir Kumar Das (1991). History of Indian Literature, Volume 1. Sahitya Akademi. p. 532. ^ Ashish Rajadhyaksha; Paul Willemen (10 July 2014). Encyclopedia of Indian Cinema. Taylor & Francis. p. 239. ISBN 978-1-135-94325-7. Retrieved 10 February 2015. ^ "Ajay Devgn on Twitter". Twitter. Retrieved 2018-09-05. ^ "Taanaji The Unsung Warrior movie on Movie Alles". Movie Alles. 2018-06-22. Retrieved 2018-09-05. Wikimedia Commons has media related to Tanaji Malusare.